The Yellow Vest protests have paralysed France for weeks on end, sending shockwaves across Europe. Is this a new French revolution in the making, or just a splash in the Seine? We ask Jacques Cheminade, former presidential candidate and founder of the Solidarity and Progress Party. Sophie Shevardnadze: So, Mr. Cheminade, the streets of Paris are getting even more colourful: the Blue Vests, the Red Scarves are new movements that marched just recently to voice their frustration with the Yellow Vest protests. Is this a sign that the French are getting fed up with all the commotion, is this the beginning of a serious pushback? Jacques Cheminade: What should be paid attention to is not the streets of Paris, it’s what happens in the whole country. And this Yellow Vests is a reaction against the state, against the administration, against the institutions and against president Macron, but Macron seen as a result of many, many years of these people, who came to the streets, having been forgotten. It’s the forgotten majority in that sense, and people want to recover their sovereignty, they want to be taken care of, and they want a state who is their state. “We are the people”, they are saying. So, it’s very important, because in the province you still have all these people meeting, and despite the efforts of the authorities to get rid of them, they are still around. And in Paris, it’s different, when they came to Paris, it’s to show that the whole France would come to Paris. Then there were all those provocators from extreme left to extreme right and the government, all these trying to disrupt the motion of the movement. But now the movement is there, and it’s a groundswell, it’s there. These people are protesting against the policy, which says that there will be a run-off from the top to their level, so they said: “It’s not true”. The money stays at the top, and the run-off goes above, it’s like an evaporation of money to the upper classes of the society, and they protest, and they said: “We want money back”, and that’s the issue. SS:No, I mean, we all understand what’s behind the point of Yellow Vests, like everyone understands it, it’s a popular uproar against the, you know, Macron’s policies for the rich, but the point is, whatever we are seeing right now in the streets of Paris, whether it’s Yellow Vests or the counter-protests, with the Blue Vests and Red Scarves, those are also people, right? And they seem to be clashing with each other, the political center has been routinely described as dead in our era of polarization, but there are the counter-protests, and is this a sign that it could be actually coming back to life? JC: Well, Macron considers the politics as an omelette with extreme left and extreme right, and he says: “we occupy the centre”. But the problem is that the centre is financially rotting, because the French elites are submitted to financial globalism, and these Yellow Vests, they start understanding, it started from the speed limited at 80 kilometers per hour instead of 90, so they need to go fast, to go to their jobs, they are far from their jobs, and they protested, then there was a gasoline price and there was a purchasing power, and then there was a call for dignity. But what they understand is that something above France, which is this financial globalism, is a real issue, and they want to recover, that our country recovers the issuance of money, now it is in the hands of the European central bank, and it’s the hands of something related to the world’s financial markets. So they have a sense that if they recover that, they can have a decent education, small and middle-sized firms at work, good police and a good army, and they call for that, they want schools, they want hospitals, they want service for the people. SS:Ok, but the point is, the message behind Yellow Vests is a noble message, no one really is disputing that, but the point is what it has turned into, and the whole chaos that it has brought along, I mean, eleven people have died at Yellow Vests protests, since they broke out in mid-November, none of the deaths happened as a result of police action. I mean, that’s a lot. The level of brutality at these protests has been remarkable. How do you explain this? JC: France has always been a very tense country, and there is, because of all the social advances in the past, and these advances are threatened today. It’s not that there is inequality per se. But there is unfair chances to get a better life. So these people protest against that. And the police was not in the cities organized for that or was given weapons against demonstrators that were not adequate. Now they have all these lanceur de balle de défense, Flash-Balls, and then they have these grenades, they call them instantaneous lacrimogen grenades. So, all this happens because there was not an organization from above to handle what will happen, it was not expected by people above. I expected it, I wrote something in 2009, saying it’s... I am writing something for the anger that’s coming, and the anger now is there, and it is there for a long time, it’s a tension in the whole country and its people, who are there... And they have been provoked in a sense, the provocateurs are those who are dismantling the social French system, and not the ones that are calling for justice and truth. SS:Talk to me a little bit more about the police response, I mean a bunch of people have lost their vision, and even eyes in some cases, as a result of police using riot weapons – at the same time the interior minister denies police brutality. Do you think acts of police violence are random, in the heat of the moment accidents, or do you feel that the security forces, a lot of whom are also injured, ended up injured, are losing their patience with the street protesters? JC: According to the state, there were 1500 injured among the demonstrators and 1000 among the police. The dead people were mainly crushed by cars, one woman was shot at, she was watching from a window and she was shot at, and something arrived and killed her, because she got a shot in the head. That’s more or less, how it is. But, there were 82 injured people with great damage for them, for example, Jerome Rodrigues, who is one of the charismatic leaders, was hit by a Flash-Ball on the head, and he is probably losing one eye. So, this has created a lot of discontent, because everybody is saying that the police has been given a free hand for an excessive handle of the demonstration, I think it is absolutely true. So, this is because in France, you have a lack of... The state is like a pyramid, and this pyramid is shaken by these demonstrators. So, everybody in the pyramid tends to overreact, and at this point, the only way to get out of it is to give to the demonstrators something that they ask for. SS:Violence, as we all know, makes news, however, I guess there is no such thing as bad publicity after all. Do you feel that the controversy is part of what has kept the movement going, bolstered its outreach efforts – and maybe still keeps it going? JC: Well, this started, among the Yellow Vests, by person-to-person contacts, and then they related to Facebook. and Zuckerberg, the head of Facebook, has changed the algorithm, so the Yellow Vests were able to connect among themselves in a much more efficient and faster way. And it was... It reacted like that. And it’s a kind of “Battleship Potemkin” effect. Something wrong happens, the sailors are given damaged meat, bad meat, and there is a revolt, but what’s important is what behind it, and what can force in public. So, of course, the media, by filming everything, and the social networks, people with their own phones, filming the whole scene has been a factor of acceleration of the motion, yes, and a lot of wrong things have been said by all people, and there was a kind also of conspirationist view of things, some people say, that it was extreme right, other say it was extreme left, other people say it was Russia who organized that. All things that created an environment where people were confused, so what I said before is try to make clear what are the real issues behind this confusion. SS:So, Mr. Cheminade, Emmanuel Macron is now on a tour through the country’s regions with the so-called “Great debate” – Q&A sessions with local representatives. Do you think this is something that the Yellow Vests have forced him to do, something useful, or is he just trying to sweep the rug under the Yellow Vests movement’s feet? JC: He’s trying to control the debate, and he appointed two ministers to organize the debate, so the Yellow Vests won’t fall into the trap, it’s clear. And also, President Macron in his letter to the Frenchmen said, and I read it – “Be as it may, we cannot continue to reduce taxes without lowering the global level of our public expenses”. So, if we start with that, there is no way to give a right answer to the demands of the Yellow Vests. He doesn’t take into consideration the possibility of a national credit. SS: These protests, they were partially triggered by climate tax, which has now been rolled back. How much more do the protesters want to achieve? And can they? JC: Well, the Yellow Vests are very angry, because, as I said, they do something and then they said they won’t do it. This is not a compromise, this is not something which is positive, it’s simply a sort of blackmail, so they don’t like this type of blackmail. SS:So one of the points that has been coming up in the debate around the Yellow Vest movement is the idea that there’s a need for higher taxes on the rich. Earlier I spoke to Jacob Frenkel of JPMorgan Chase, and he said that such measures end up dissuading the rich from saving and investment and thus hamper growth for all. Won’t a tax on the wealthy only drive them away from France, into some kind of a tax haven? JC: There has already been a move out of France of some of the rich people. The issue is not that. The issue is that Macron organized a policy for the “first climbers”, and the other thing is that they are the core victims, so you can’t organize an economy thinking that the “first climbers” would give money and would organize the economy for those who are below them, under them. The issue is not so much to tax the rich, it’s to create wealth, and you create wealth by public credit for the future, betting on the future. This is what has been the policy of France after World War II, when there was nobody to tax because there was no wealth, there were no things to sell and there was nothing, no money to be found. So there was public credit, a bet on the future, and it worked – France was reconstructed. And I think that Russia – the Soviet Union of these days – was also reconstructed by the will of the people and credit for the future, and that’s the issue. It’s not to tax the rich as such. SS: Another thing is that the movement of the Yellow Vests doesn’t really have a leader, or so they claim, that they don’t have a leader. It’s really hard to understand what exactly they want, because there is no one person who would speak out for them. How can Macron placate them and cave in to their demands, when they don’t really have a go-to working group to talk or negotiate? JC: You know, this thing looks like... In a way it’s very different, but it looks like the beginning of the French Revolution, when there were no leaders. And in such a movement these people – the Yellow Vests – they didn’t know each other, most of them never went to demonstrations. They are craftsmen, they are middle-class people from a working-class background, that’s what they are. So, they found themselves to be there. One saw that the king is naked, and another one saw that the king is naked – the king being the monarch king – and now they said: “Yes, we all think the same thing, and we want to be together, and we despise political institutions, we despise politicians. The level of respect for politicians at this point in France is 9%, and the most respected thing is the public hospital, which is 90%, so you have that. So, these people have a fear to be leaders, and it’s what some would call, Rosa Luxemburg in the old days called that a mass strike ferment, it’s a ferment. So in this ferment, there’s no real leader. Some appear, like Eric Drouet or Priscillia Ludovsky, there are names. Others try to launch a list, but this list was patronized by Macron, because Macron expects that a list of Yellow Vests would siphon votes out of the extreme left, extreme right and out of the center-right opposition. So, there are all these calculations, but this Yellow Vest movement is so difficult to characterize as a political movement, that the only way to give them a purpose would be the issuance of money, how the money is issued and for what. If not, it will be something that would remain as a groundswell in France hitting the institutions, hitting the political world and not going anywhere. Look at it – in the United States you had Trump for the same reason, in Italy you had the present so-called populist government. In France it’s something more, it goes more in-depth of the fabric of society. SS: Talking about the fabric of society – you have all of these people, a lot of them united by what they are against. Do you think the movement will split as soon as the time comes to decide what you are for? Because right now the only thing uniting them is the “against”. JC: Well, what unites them is also the citizens referendum initiative, what they call the RIC – Référendum d’initiative citoyenne. And they want that because they want participative policies, they are fed up with representative policies, so at the same time, it’s very interesting, but at the same time they need an education, so it will be a long process for them to be educated in how the society functions. They know it functions in a wrong way, but they don’t know how to make it function in a right way, and my job as a, let’s say, dissident politician is to organize them to understand what they have to do positively. It’s difficult, it will be an educational task which will take long, but it’s very interesting; you have one of these yellow vests who launched a petition from Southern France calling for a national bank and saying there should be this referendum, but the question should be a national bank and not how many deputies are you against, or not against abortion, or against this penalty – not those issues, so-called social issues, but the real issue, which is how you organize a state, and how we issue money, and for what. And this demands, to be truthful, a break with the present European Union, and for the respect of the true European civilization. SS: It seems to me that the Yellow Vests are like other street movements – Occupy, or even the Arab Spring, or the Greek and Spanish protests. Do you see any similarities? JC: As of now, they meet in assemblies throughout the country, and they discuss, and they try to figure out what they want. We are at this point, but at the same time you have other movements, you have a movement of nursing helpers, you have a movement in hospitals against cutting the financing of hospitals, so nurses are in a state of rebellion, and also doctors. You have the Red Pens from education. People, for example, if you want to measure the social conditions in this country, a person who started as a teacher would gain more or less twice – 200% – of the average wage. Now it’s only 100%. So, there’s a lowering in the income of people in the whole social services – that explains, in part at least, the Yellow Vests. The other part is that they don’t feel represented by the usual politicians, and they are trying to find among themselves, who will represent them. So, really, that’s something that’s not short-term. SS: With the grassroots leaderless movement like the Yellow Vests, you will have your share of wacky people, crazy people - but it seems that anti-Semitism, belief in conspiracy theories, Holocaust denial, all of that is very much present among the Yellow Vests. Do you feel like Yellow Vests are maybe in danger of being hijacked by radicals like this? JC: No, I don’t think so. They are being provoked by radicals all the time, but they themselves take care of the radicals. The thing is, that it was, being this type of ferment, this type of uprising, they had no security service, so now little by little, with the help of some unionist, they are organizing a security service for their own demonstrations. So, it’s a process of education, and my bet is that this process of education would lead them in a good direction, good for the people, good for the nation. After all, the French constitution said that the principle of France is a government of the people, for the people and by the people. They have to understand that, and that means respect of all what belongs to the state, and not all to become individual property, and not to break things around. So, I think this rage is there, but it’s very limited to very few Yellow Vests, and it’s provoked by extreme right-wing and extreme left-wing agitators, and, probably, also in the police, or even in the government, some people expected that violence would discredit the Yellow Vests, but I think this won’t work. SS: Some Yellow Vests want to branch out into traditional politics, preparing to run for the European elections, others condemn the idea and are pledging to keep up their street brand of politics. How big can this division get, can the rift grow big enough to splinter the movement? JC: This list is in advance absolutely discredited. Ingrid Levavasseur, who is a head of the list, a woman, a nurse – this woman was recruited by BFM TV, the media which is hated by the Yellow Vests. So, she has not in any sense, let’s say, a personal authority to head this list, and already two people left this list. One of them was a hidden Macron agent, and he had to leave. So, this list would lead to nowhere. Probably, the true leaders, the few leaders who have an influence, they are not leaders in the usual sense, but they are references of the Yellow Vests, they call for no list and they call for a long-term thinking and education, and from that would come in-depth emotion in French society, which is much beyond the European elections. I think these European elections are in advance fake, because if you have on one side a so-called populist or nationalist or sovereignist, on the other side a progressive and so-called reformist, it’s just a construct, it’s nothing, it doesn’t go into the real problems of the country, and the Yellow Vests are more connected to the real problems of the country than the politicians running in the European elections. 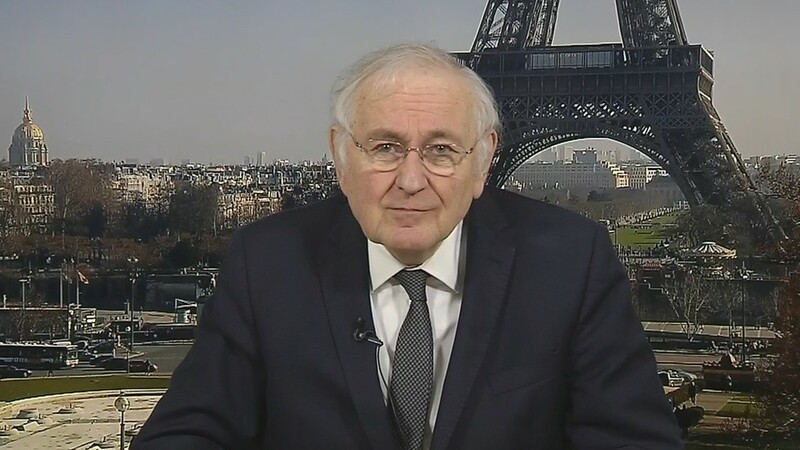 SS: Alright, Mr. Cheminade, thank you very much for this interview, we were talking to Jacques Cheminade, former presidential candidate and founder of the Solidarity and Progress Party, discussing the French protests.